A key feature of all scientific theories it that they must stand up to extreme, honest scrunity by the scientific community and strongly supported by empirical, not anecdotal evidence. Yet astrology has been around for thousands of years, and it seems that there are still great problems in which it cannot answer. Let’s take take a look. Precessional motion occurs when torque is applied to an rotating object and changes the direction of its axis of rotation. This occurs because the torque increases the angular velocity of the initial angular velocity of the rotating body, causing the axis of rotation change direction. This effect also happens to the Earth. 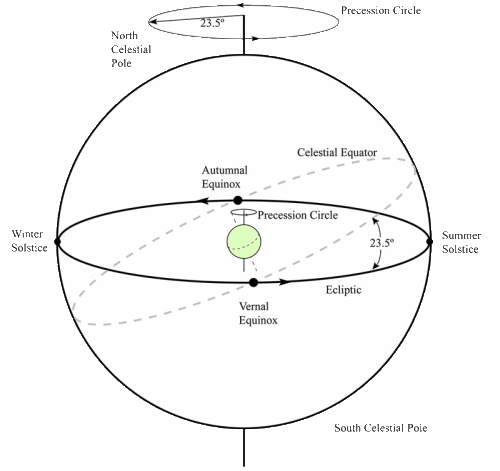 Known as the precession of the equinoxes, it is the slow westward motion of the equinoxes about the elliptic, and it is caused by the torque crerated as a result of the gravitational attraction of the Sun and the Moon pulling the bulge at the equator towards the elliptic. A full 360 degree turn takes about 25,800 years. So what does this hold for astrology? Nothing good. Take 25,800 years divide 360, and you get around 72. 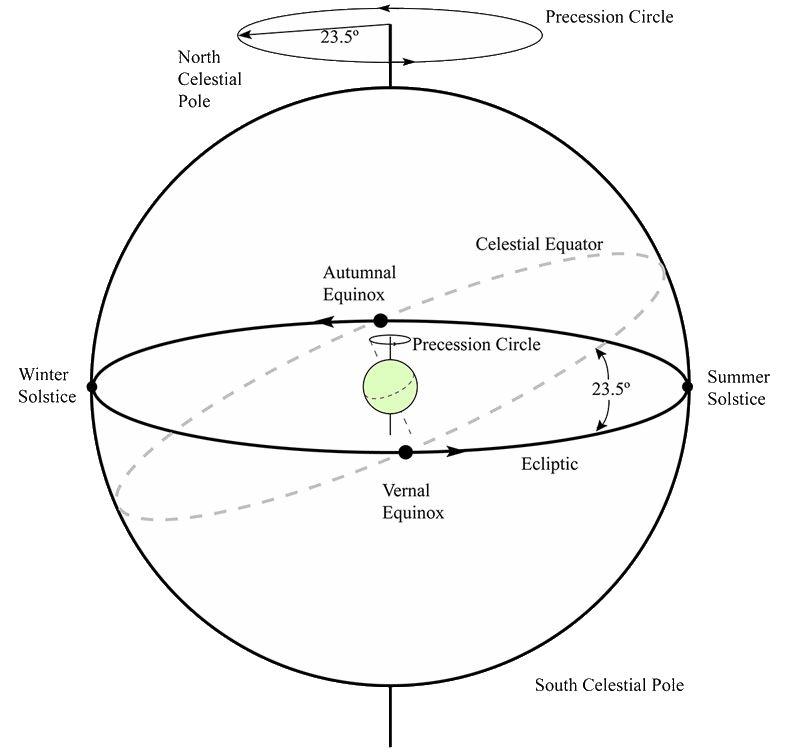 In other words, it takes around 72 years for the direction of the axis of rotation to be offset by 1 degree. Since the house in astrology have never been updated since the Babylonians created them around 2000BC, that means they have means the equinoxes have gone out of place by around 56 degrees (4032/72 = 56). Oops. If you’re Capricorn, you should be a Scorpio/Sagittarius now. Why hadn’t astrologers update the position of the houses? Why Isn’t Natal Astrology Based on the Moment of Fertilization? Natal astrology focuses on predicting a person’s life based on the individual’s exact time, date, and place of birth. Needles to say, this is very problematic. Why care about when is the individual born? The hypothetical force should after, be perfectly natural as astrologers love to claim (after all, astrology is a science, and science only addresses the natural! ), and I don’t see why should the mother’s womb act as a barrier to that force, preventing it from having any effects on the baby. A better model would be to measure the moment of fertilization, as all embryonic developments later on are largely dependent on this process. Of course, there is no way yet to determine when does this occur, which renders natal astrology useless. You are rock-solid, dependable, responsible, highly organised, goal-oriented, logical and clever. You thrive in positions of power or any job where maths or money are involved. Consider an IT position because you love software and computers. You are also well-suited for being a doctor, accountant or lawyer. Huh? I mean, why are there Capricorns overturning the Chinese monarchy, leading Communist Russia, being the King of Boxers, and shocking the world with his great songs? Shouldn’t Capricorn after all, be conservative? And how does Mao and Stalin be responsible and dependable when they killed millions? That just doesn’t fit. I’m waiting for an explanation. Astrologers claim their work is science. To be considered as such, astrology must stand up to critical and sceptical scrunity. No astrologer I’ve ever seen could answer these questions, and before there is an explanation for the problems stated, astrology is bunk, or at least extremely inaccurate and unreliable. John Daintith BSc, PhD & Elizabeth Martin MA. (Eds.). (2005). Oxford Dictionary of Science. New York: Oxford University Press. "You are rock-solid, dependable, responsible, highly organized, goal-oriented, logical and clever." They always start out with flattery; listing qualities that everyone would like to think they possess. "You thrive in positions of power or any job where maths or money are involved. Consider an IT position because you love software and computers. You are also well-suited for being a doctor, accountant or lawyer." A little more flattery, then they try to cover as much of the population as possible. They will usually Taylor this to the type of publication that your horoscope is published in. I'm guessing you found this one on line because it mentions IT love of computers and such. Had you found this in sports illustrated you would probably "have a love for the outdoors" and you would be "enthusiastic and energetic with a true sense of fair play." I've always found it hard to fathom why anyone in their "right mind" could possibly take any of this drivel seriously, but I've meet many that do! Great post, keep up the good work. A common characteristic of pseudoscience and superstition is that they make extremely vague and general claims so that they cannot be disproved empirically. Thus the claims that astrology is untestable using the scientific method, but this only makes astrology as unscientific as it can be. I shall address this problen in my Sceptical towards Pseudoscience series. dude, i am not trying to say that astrology is true or false, but if you are about to discuss astrology you should consider "real" astrology. i mean, birth charts and everything, not just this "online astrology". a birth chart is way more specific because it considers the influences of other planets and stars, not just the Sun. ved bhawan vedic yagya professors gives courses and Astrology Consultations. Some of them are all-rounder and give lessons and courses of Sanskrit, Hindi, Vedic Astrology, Karmakand & Hinduism while some give only courses on Vedic Astrology. As they don't stay long time in your area, the program is structured to complete a course intensively in an un-traditional and modern strategy. the benefit of this program is that you don't have to travel far or even you don't have to spend anything more to get a lesson or a consultation with a professor coming in your neighborhood.